Hehe! It all started when Boonk asked, “Do you know what’s Andy Lau drink?” Huh? How would I know what Andy Lau likes to drink??? Hehe. He’s referring to a term that’s commonly used in our local kopitiam. Our local kopitiam drinks uncles have given nicknames to all the commonly ordered drinks. 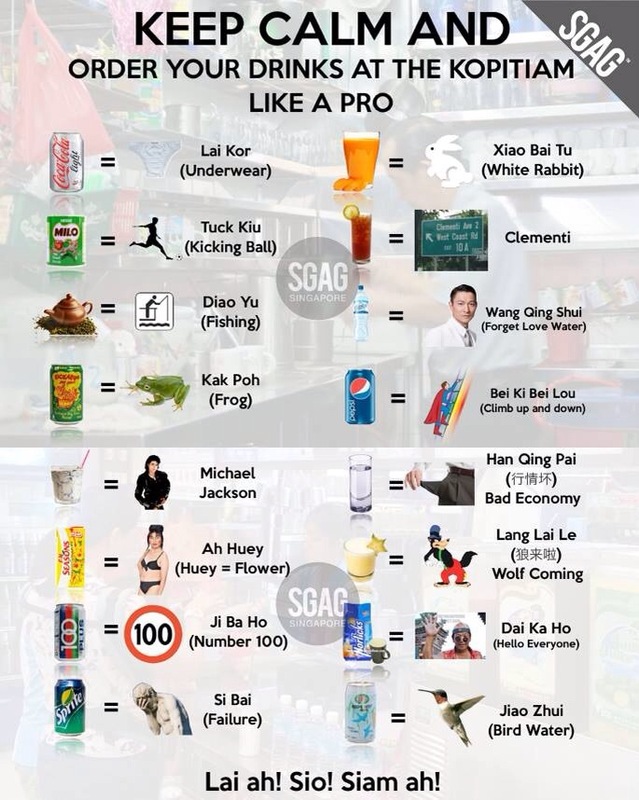 If you want to immerse in our local kopitiam culture try ordering these drinks!! I’ve absolutely no idea how these names are derived. If you do, do leave a comment and enlighten all of us! Coke light = Lai kor – I think it’s due to the similar sounding words? ?? = Xiao Bai Tu (Little White Rabbit) -I seriously don’t know what drink this is!! If you do, let me know!! *a suggestion from Sharon (Thanks!) that it’s Pokka carrot juice. Makes sense!! Water = Hang Qing Pai (Bad Economy) – No money so drink water lar!! ?? – Lang Lai Le (Here comes the wolf!) – I must confess that I don’t know this as well!! Can someone enlighten me?! *According to Ernest (who is part time kopitiam uncle) it is star fruit juice!! Because when the wolf comes, the sheep runs away 羊逃 it sounds similar to star fruit in mandarin. That’s all, folks!! Something bo liao for today! Ermmmm… Pepsi in Chinese is 百事可乐. Okie. Corrected!! What about the other 2?? Good idea! Date time place?! Wolf.. I wanna know too! I just found out what the wolf one is. It’s star fruit juice…. Wow! Very impressed with Kopitiam Uncle Ernest coz I can’t figure out the wolf too. That’s why he’s the uncle. Every day la kopi.